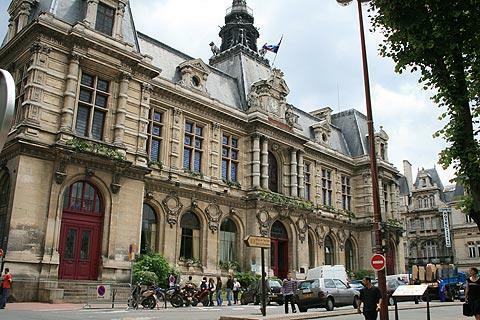 The town of Poitiers is centrally placed in the Poitou-Charentes region, of which it is the administrative capital. 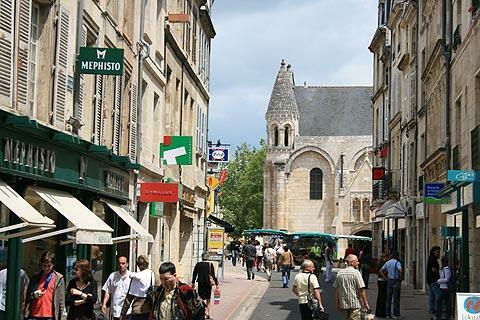 Slightly off the main tourist routes, Poitiers is none the less a town steeped in history and this has resulted in a city with a picturesque medieval centre containing numerous sites of interest. 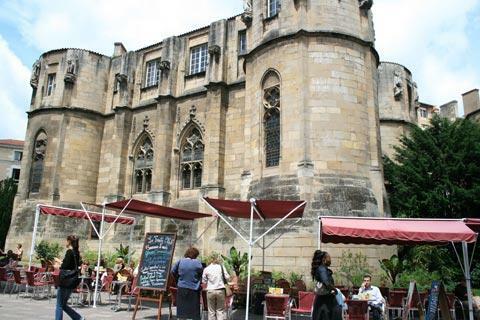 Poitiers is also a university town (the second oldest in France after Paris and the town with one of the biggest student populations) which means it has a vibrant night life and lots of cultural activities. Previous students include Descartes and Francis Bacon. 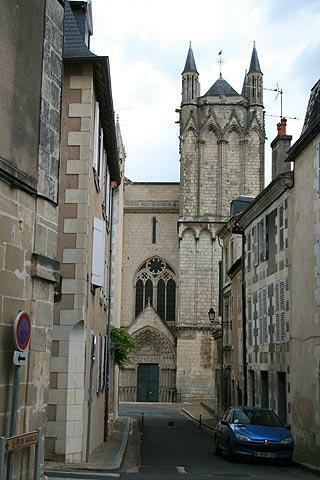 When you arrive in Poitiers we suggest you head straight for the tourist office (near the Notre Dame church) and ask for their map of the town with the tourist circuits marked out. There are three circuits each taking around an hour to complete. All three are recommended so allow plenty of time for your visit! 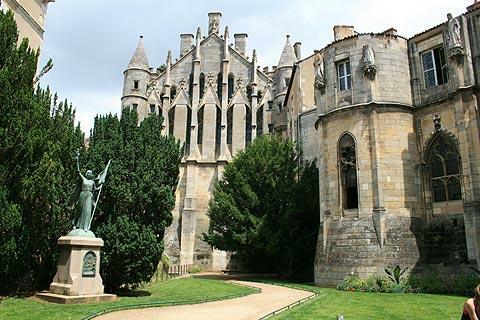 The blue circuit leads you around the most important monuments of Poitiers such as the baptistry, cathedral and church of Notre-Dame, the yellow circuit leads you round the main sights in the historic centre, and the red circuit takes you to the area around the Parc de Blossac. 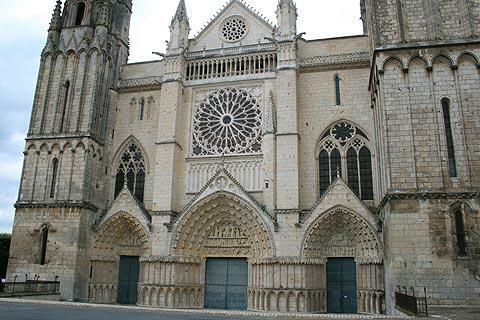 Of the many interesting historic buildings in Poitiers it is the religious monuments that dominate a visit. 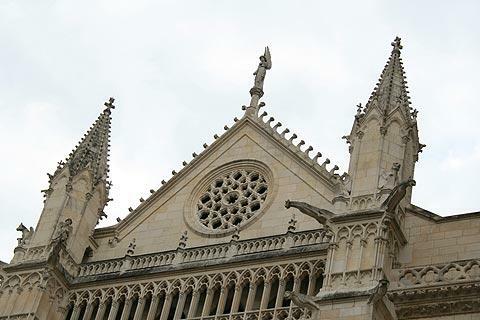 Start your visit with the Eglise Notre-Dame with its very ornate facade dating from the 12th century and an important example of roman style architecture. The interior is also impressive, with its colourful frescoes and patterns painted on many of the columns, as well as further examples of carved stonework. France This Way comment: if you are near Poitiers during the summer, be sure to be near the Notre-Dame church at dusk, when an impressive light display recreates the colours of the cathedral in the Middle Ages. Now move on to the magnificent Saint Pierre Cathedral, a Gothic building dating from the 12th century and also with an ornate facade. Inside you can see an enormous 18th century organ and some impressive stained glass windows. 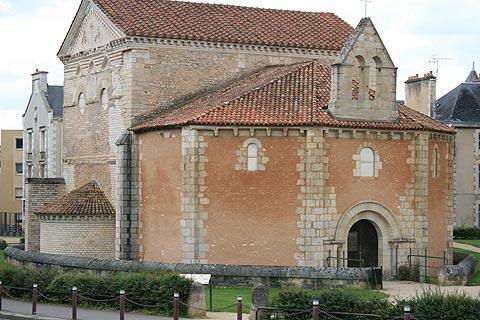 Nearby is the rather austere Baptistry of Saint-Jean, dating in part from the 4th century and the oldest Christian monument in France. The building contains a large baptism pool from the days of early christianity when baptism was by full body immersion. You can also see some great frescoes from the 12th and 13th centuries in the baptistry. Although these three are the most important religious monuments in Poitiers there are several other churches that you will discover as you explore such as the imposing square tower of the entrance to the Church of Saint-Porchaire, the Church of Saint-Hilaire-le-Grand with its carved roman style capital stones (a UNESCO World Heritage site for the Pilgrimage path to Saint John of Compostella), and the crypt in the church of Sainte-Radegonde. 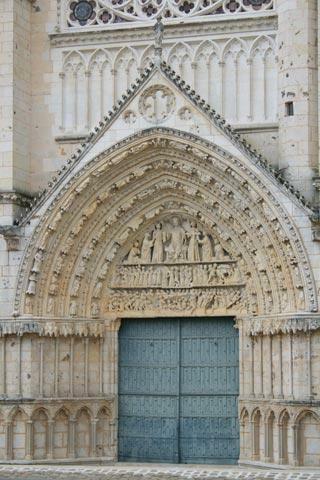 Poitiers was the province’s capital city even in Gallo-Roman times but its most famous and prosperous period of history was during the middle ages in the times of Eleanor of Aquitaine. In one of the most turbulent periods of French history, Eleanor had her marriage to Louis VII of France annulled and then married Henry Plantagenet who subsequently became King Henry II of England (1152). As a result large areas of western France including Poitiers passed under English control. 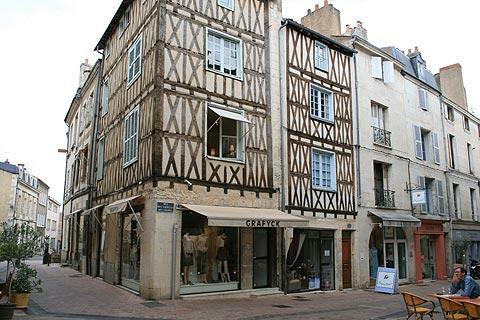 Poitiers became an English town as it was part of the dowry she brought to her marriage. Eleanor liked the city and often spent time there and her support led to the building of some remarkable buildings such as the Eglise Notre Dame la Grande, which is a Romanesque style church. The division of France led to continuous struggles between the English and French, that ultimately led to the Hundred Years War (1337-1453) - the Battle of Poitiers was one of the great English victories of the war. 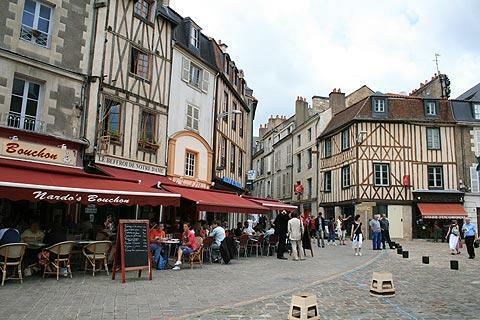 The streets in the historic centre of Poitiers around the Church of Notre-Dame-la-Grande are full of lovely medieval architecture with lots of half timbered houses as well as impressive examples of renaissance architecture. The law courts are also very distinctive. Lovely to walk around in, these streets are also full of great shops! The Jardin des Plantes is not far from here if you want a nice spot to relax for a while. 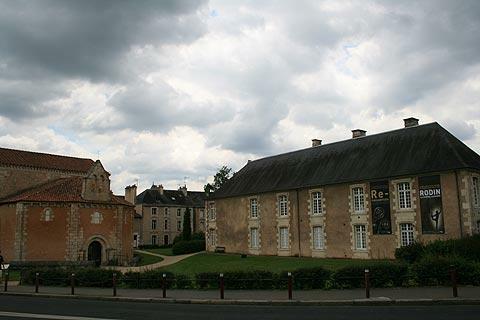 Other buildings of interest include the 19th century Town Hall and several grand townhouses built during the 17th and 18th centuries such as the Hotel Fumé and the Hotel Berthelot. To the south of the town centre is the Parc de Blossac, a lovely place to relax and perhaps have a picnic (there are also several other attractive parks in Poitiers). 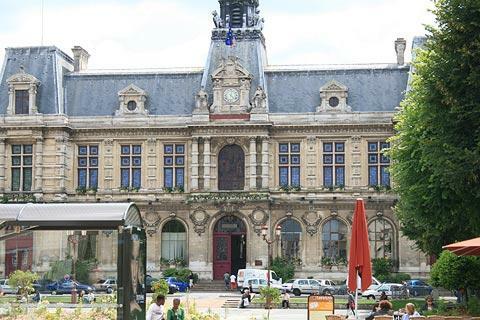 Although it is a short walk outside the town centre, this is one of the main attractions in Poitiers, and as well as the plants and trees there are children play areas and a chance for children to see small animals. 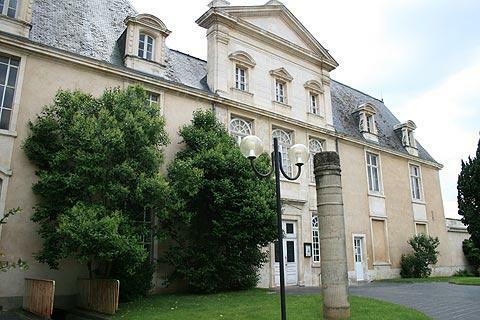 The Museum Sainte-Croix has examples of local paintings as well as items of local historical and archaeological interest. 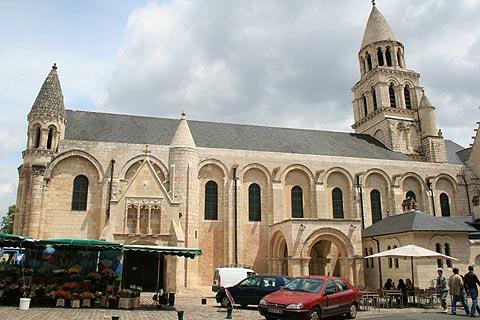 In the vicinity the villages of Chauvigny, Montmorillon, Châtellerault, Loudun and Civray are all worth a visit. The cave system at La Norée is recommended, and the abbey at Nouaille-Maupertuis is another impressive example of roman style architecture just a few kilometres from Poitiers. Also close to Poiters for those of you with children Futuroscope is a great theme park packed with virtual reality rides and shows. You can find more local travel ideas in the Vienne guide and the Poitou-Charentes guide.